The venue has a significant capacity so it would be great to fill as much of it as possible. But people can just come as well. Please see attached evite for circulation, and please feel free to send invites from FB if you are on that platform. Syrian refugee Hassan Al Kontar became a media sensation last year after he found himself living in the arrivals terminal of... a Malaysian airport. Al Kontar quickly realized that his situation was not because of who he was personally; it was because he carried a Syrian passport. Al Kontar spent 7 months at the airport and 2 months in detention before finally being allowed to come to Canada in November 2018. 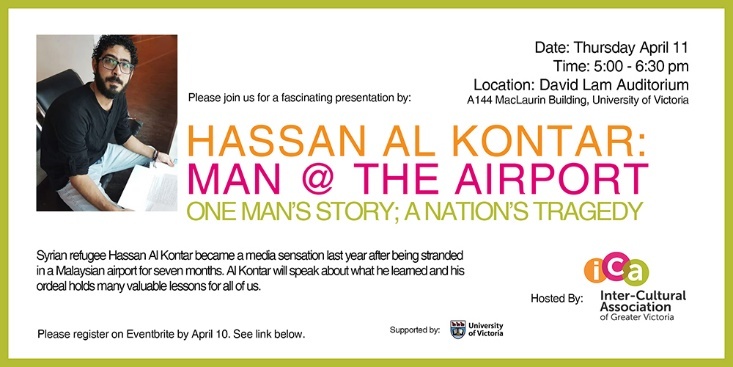 In this presentation, Al Kontar will talk about what he learned as a result of his experience, the plight of refugees around the world, and how individual Canadians can make a difference. Many thanks to the University of Victoria for providing the venue. Winner: Merit Award: Best Shorts Competition and Selected: National Screen Institute (NSI) Online Short Film Festival. Based on her fieldwork, Karoline will address the problems of inequality, cultural appropriation, and more, associated with tourism in Latin America. Benefits of tourism, as expressed by local people, will also be discussed. The presentation will be accompanied by slides from Dr Guelke's travels. What can you do when you witness public instances of anti-Muslim, anti-Black, anti-Trans, anti-Indigenous or any other form of interpersonal violence and racial harassment? This workshop provides tips on how to intervene while considering the safety of everyone involved. It includes resources and tools, group discussion and role plays. *Where:*First Metropolitan Church, Room 119, 932 Balmoral Road , Victoria, B.C.